Lumbermen on Bull Chain, Big Muddy Lumber Company, by Ione, WA, circa 1921. Standing in back: Frank G. Ellersick, unidentified, Jack Ellersick. Sitting in front: unidentified, Walt Ellersick, John F. Ellersick reading newspaper. The rest are unidentified. First arriving in Ione in 1915, when Pend Oreille County was in its infancy, the families of four Ellersick brothers, Henry, William, John, and George, continued their logging and sawmill operations. The Ellersicks had previously operated large, successful lumber businesses in Minnesota and northern Idaho. However, due to a disastrous turn of events in Idaho, the family left for northeastern Washington hoping to recoup lost assets. Many family pictures show the brothers standing by their sawmills or by huge wagonloads of logs. Written on one picture is the caption "White Pine Savages." These four brothers and their sons, dubbed the "White Pine Savages," developed an ardent work ethic logging the mighty white pine in the forests of Minnesota, Idaho, and Washington. Their lives as lumbermen encompassed forty years, 1885 to 1925. My grandfather, George Herman, was the last Ellersick to make a living in the lumber industry in Pend Oreille County. He worked for the Diamond Match Company from the 1930's to the 1960's, the latest years as production manager for the Northern Division. Ellersicks currently living in Pend Oreille County are direct descendants of Herman Heinrich Ellersiek who, according to the 1900 U. S. Census, came to America from German in 1854 at the age of 28. Prior to 1871, there was no German nation, but only a collection of separate German states. Some family members think Herman emigrated from the Westphalia, Prussia area to escape military duty, although other family members do not recall this. The revolutionary troubles of 1848 may have also furnished a motive. These may have played a part in his decision, but most likely he was drawn to the United States by economic reasons, as were hundreds of thousands of other Germans in the 1850's. Herman, born in Enger, a farming area, probably saw little future on the family farm and so sought opportunity in the United States. It was a tremendous adventure to leave the troubles of Europe behind, and to make a home in a half-empty land bright with opportunity. Herman worked as a farmer in Illinois and Indiana and married Anna Mary Dorfmeier in Dubois County, Indiana 1854. According to the Ellersick family Bible, Anna was born in Haringhausen, Germany, close to the same area as the Ellersicks and their families may have known each other in the homeland. Herman and Anna Mary had six children while living in Illinois and Indiana: Anna, born in 1855, in Indiana, died in 1857; Henry, 1857, Dubois, Indiana; Mary, 1860, Indiana; William, 1861, Pike, Indiana; John, 1864, Vandalia, Illinois; and Anna, 1867, Effingham, Illinois. The 1870 United States Federal Census shows Herman and his family farming on land valued at $800, in Mound Township, Effingham County, Illinois. According to Frank J. Ellersick, the Ellersick children did not attend school and only spoke German at home. Their bedtime prayer was said in German and the children repeated the last line, "Ich habe gebetet, Gute Nacht!" until a "Gute Nacht!" response was heard from their parents. The following German version was found in the Ellersick family Bible, which Frank J. Ellersick has at his home in Twin Lakes, Idaho. mehr als ich verdienen kann. das ich morgen besser sei. Ich habe gebetet, Gute Nacht! as you did before more than I deserved. I have prayed, good night! The Ellersick family traveled up the Mississippi River from Illinois into Minnesota sometime between late 1870 and early 1871 and continued farming. Herman and Anna's last child, George Frank, my great-grandfather, was born in August 1871, in Kandiyohi County, Minnesota an area with a large German population. The Ellersicks changed from farming to lumbering most likely because Herman and his four sons, who were young men now, read the signs of the time and saw potential in the lumber industry and so changed professions. Modern Woodworkers of America. The MWA was a fraternal society furnishing life insurance. Sitting in front at the far left is Henry Ellersick, the third from the left is John Ellersick. William Ellersick is in the middle row, wearing the hat. George Ellersick is the second from the left in the back row. In the late 1800's, vast forests covered the upper Mississippi River and Great Lake region. In Minnesota, the prairie met the pine. The prairie lands and the pine lands were both greatly in demand. Incoming settlers coveted the fine prairie lands just as lumbermen coveted the timber. The farmers on the prairie were eager for lumber produced nearby, and lumbermen were eager for the market that was developing on the prairie lands and in the rest of America. White pine lumber was good wood and was greatly desired. In addition, it was inexpensive to the consumer, so forests were logged of much of the pine. The 1880 Census shows the family in Germania Township, Todd County. Herman built a sawmill on a piece of land bordering the southern part of Pine Island Lake at the mouth of the Little Elk River in Turtle Creek Township. His sawmill furnished large amounts of lumber to the settlers and to the neighboring villages. After years in the lumber business at Pine Island, he turned his attention to other matters. By 1885, the Ellersicks had moved to the Browerville, Minnesota area where the enterprising Herman created a flourmill and operated it a few years. This area in Minnesota is near the famous Pillsbury family flour millers. Ellersick Flour Mill, Browerville, Minnesota. Herman and Anna's four sons all married sisters in the Lemke and Kahlert families in Minnesota: Henry married Bertha Lemke in 1885, William married Louise Lemke, John married Fannie Kahlert, and George married Emma Kahlert, 1891. Herman and sons' success in manufacturing lumber made them desirous of engaging again in that business. They sold out their Browerville flour mill and in the first part of 1893, the Ellersicks moved seventy miles north, into the heart of Minnesota's northern pinelands, to Park Rapids and worked again in lumbering. In 1893, Herman Ellersick and his four sons built a single circular sawmill at Park Rapids on the Fish Hook River. The picture shows that the sawmill was located on Great Northern railroad tracks, making it convenient to transport the lumber to market. Park Rapids Lumber Company, circa 1900. Ellersicks with Crew of Park Rapids Lumber Company, Minnesota, circa 1900. John Ellersick, one of the sons, held a Minnesota State Inspector's Certificate issued 20 June 1892, licensing him as a Special Engineer to take charge of Stationary Steam Engines, Steam Boilers, and other apparatus for generating steam. Steam power was critical to sawmill operation at that time. The forests of the white pine were vast and dense, and many believed that these forests in Minnesota would last forever and would be sufficient for all time. However, they began to decrease within the lifetime of the men who began logging them. Even by 1890, when the Ellersicks entered the lumber business, most of the virgin forests of the Great Lakes had been cut over. The timber that remained was not enough to sustain the families who operated the immense sawmills. The predominant Minnesota lumber barons, such as Frederick Weyerhaeuser, were looking West for new timber stands, and James Hill's completion of his Great Northern Railway to the Puget Sound from St. Paul, Minnesota in 1897, opened up a new empire. 17,730-foot load of logs on sleigh hauled 10 March 1899 to Ellersick's Park Rapids Lumber Company. William Ellersick (3), teamster; Royal Clough, scaler; loaded by George Ellersick (4), Frank Benning, Henry Lemke, Thomas Beck. Herman Ellersick (1), Henry Ellersick (2), John Ellersick (5). Photograph by L. D. Smith. In coming to America, Herman Ellersick had realized a dream. He married, had a large family, and managed a successful company. However, at the beginning of the 1900's when he was in his seventies, the same dream and spirit that propelled him to America was still with him and had also been instilled in his four sons. The Ellersicks were ready to risk what they had gained for even greater opportunity and so planned to move west. Nowhere in the far Northwest did the Weyerhaeuser group cherish brighter hopes at the beginning of the twentieth century than in Idaho. At the northern tip of the Idaho Panhandle grew dense forests of Douglas fir, white fir, spruce, ponderosa, lodge-pole pine (most common of all Idaho evergreens but not used commercially), red cedar, larch, and the western white pine among the high mountain valleys and beautiful lakes and rivers. Western white pine was the aristocrat of the forest, sometimes reaching 200 feet in height. In August 1900, Weyerhaeuser and other timber experts sent crews west from Minnesota to explore for white pine. "Four Western Toughs" This caption appeared in an old family photograph album that Frank J. Ellersick now has. The November 1899 photograph shows the Ellersick brothers, left to right: George, John, Henry, and William. By 1900, Herman and sons were successful and had considerable stumpage in Minnesota, but the Ellersicks decided to make their own cruises for white pine wishing to create still more extensive operations. In November 1899, Herman and Anna's four sons were sent west to scout for timberland and an even better future. The photograph captioned, "Four Western Toughs" shows them on their journey. Each has one foot in Washington and one in Idaho. They are standing on the bridge between Lewiston, Idaho, and Clarkston, Washington. They also searched for timber on the Washington coast, in the Spokane, Washington area and in the Northern Idaho Panhandle. They settled on a site on the Northern Pacific Railroad line in Kootenai, Idaho. The area was still primitive and largely unsettled, but the decision was made because of its location in the midst of white pine stands. In addition, rail transportation, along with water, was a key to moving lumber to market. They could use the railroad to ship their cut timber. The numerous streams transported the logs into Lake Pend Oreille where they would be stored. Pend Oreille Lake and River mapfrom John Fahey's book, The Kalispel Indians. Drawn by David Anderson. Used with permission of University of Oklahoma Press and Cheney Cowles Museum, Eastern Washington State Historical Society, Spokane, Washington. In Park Rapids, Minnesota, the Ellersicks were remarkably successful and in closing up their operation at that place were believed to have had forty or fifty thousand dollars. The Sandpoint, Idaho newspaper, The Republic, announced in the November 6, 1901 edition, "The Ellersicks are expected to leave St. Paul about August 6th to build a mill at Greenough's Spur." Herman and Anna Ellersick, their four sons and their families (John, Henry, William and George) traveled west via four cars on a chartered train, bringing all their employees, personnel, business, and survival necessities to Kootenai, Idaho where they built a sawmill, planer, homes, and the Company Store. The store was operated by Herman Kahlert, George, and Jack's (John's nickname) father in law. They built a single-band sawmill at Greenough's Railroad Spur, two miles north of Sandpoint on Lake Pend Oreille, and called it the Kootenai Bay Lumber Company. The brothers brought their lumbering skills and expertise from Minnesota and were versatile in all aspects of the lumbering industry, but each had his own specialty area: Henry, the inventor, did the planning and designing; William supervised the logging; John was the steam engineer; and George, the millwright, built and set up the mill. The brothers and their wives were busy raising large families. The children of the four brothers and birth dates are listed: Henry and Bertha: Lillian, 1885; Emma, 1887; Ida, 1891; Harriet, 1893; Louise, 1895; Josephine, 1897; Harry, 1900; and Marion, 1902. William and Louise: Eva, Marion, Henrietta, Samuel and Robert, 1893. John and Fannie: William, 1892; John, 1893; Isabelle, 1895; Walter, 1897; Frank G., 1898; and Florence, 1901. George and Emma: Adeline, 1894; Alfred, 1897; Gertrude, 1897; Ella, 1900; George, 1903; Ernest, 1909; Harold (died at birth) and Howard twins, 1914. A tremendous setback to the Idaho dream occurred when the essential man in the lumber operations, Henry Ellersick, died from cancer at the early age of 45 in 1902 at Kootenai. Henry was "the brains" behind the operation. After Henry's death, the Ellersicks kept the Kootenai Bay Mill less than a year and then sold it to the Humbird Lumber Company, a subsidiary of the giant Weyerhaeuser Company. At the time of the sale, the Kootenai Bay Lumber Company payroll records show 123 employees in September 1903 working six, ten-hour days per week. Incidentally, wages at that time were 20 cents a day for laborers and 60 cents per day for the sawyer, filer, and foreman. After Henry's death, John Ellersick bought a family burial plot in Fairmont Memorial Park in Spokane. Following the sale to Humbird, all the families, except William's, moved to Spokane. While in Spokane, John operated a saloon in 1905 and 1906, but the brothers planned to return to the lumber business. Opera Bar, Spokane, WA, John Ellersick at far right, circa 1905. In 1907, they built a large sawmill and planer at Riverside, Idaho, just down the railroad line from their Kootenai Bay mill. Riverside, near Laclede, Idaho, on the Pend Oreille River, is by the ancient Seneacquoteen Indian trail and ferryboat crossing. John Ellersick's family home stands by the river today and operated as the River Birch Farm Bed and Breakfast in the 1980's and early 1990's. Ellersick’s Riverside Lumber Company, Idaho, circa 1910. The Ellersick Riverside Lumber Company payroll books show records from March 1903 to March 1914. The last month's payroll lists the following Ellersicks: William Sr., John Sr., George, Fred, Walter, Frank G., John Jr., William Jr.; and Henry Lemke (Henry and William's father in law) and W. J. Johnson. Anna Ellersick passed away in 1907 and the man who started the venture, Herman Heinrich Ellersick, died at the age of 88 in 1913 in Sandpoint, Idaho. In 1914, shortly after Herman's death, the Ellersicks lost their mill. It must have been sudden as Frank J. Ellersick was told that his grandfather John threw himself on the bed saying, "We have lost it all!" The cause of this disaster is not exactly known, but family members have passed down the following theories. One thought is that they kept their funds in a German bank and at the beginning of World War I, the banks closed and they lost all their money. Another story is that a crooked bookkeeper swindled their money. Another family story is that during World War I, John and George had a time-limit contract for spruce on Mount Spokane. Due to a diphtheria outbreak among the Ellersick logging crew, they could not fulfill the contract, so the Diamond Match Company stepped in, and their financial holdings were lost. The last idea about how the mill was lost is that the devastating fires of 1910, or other years, burned valuable family forest land and maybe the mill burned down. Family members have told the story of how the family hurried into boats with as many possessions as they could and stayed on the Pend Oreille River to escape the raging fire. The Ellersick lumber operation payroll book for this time though scorched by fire has survived to this day. All of these explanations may contain truth, but none have been substantiated. Demand for lumber was depressed. According to David H. Chance's The Lumber Industry of Washington's Pend Oreille Valley, 1888-1941, in 1914, in the larger mills in the Inland Empire, only 47% capacity was used. Chance also reports that 1906 was the peak year for per capita lumber consumption and consumption steadily declined through the depression. Therefore, in this strong current of a declining, disappointing lumber trade, the specific events or combinations of events remembered by family members seem plausible triggers to the Ellersicks' loss of everything they had from their Minnesota lumbering success. Thus, the end of an era for the Ellersicks in the sawmill and lumber industry had come. Herman Ellersick had built success upon success. His great adventure to the United States had been realized. Times had changed and the brothers and their families reached out to other vocations. William and family stayed in the Riverside, Idaho, area. John, George, and Bertha (Henry's widow) remained together and returned to their Spokane, Washington homes. Although family members today do not have knowledge of Ellersicks in Pend Oreille County before the 1920's, the "White Pine Savages" did not stay out of logging and sawmilling long. Charles Barker remembers the Ellersick Brothers cutting for the Lost Creek Cedar Company in 1915 and 1916. Barker served as Pend Oreille County Chief Deputy Sheriff from 1919 to 1920 and clerk from 1921 to 1966. At that time, the mill capacity was 25 million board feet and Barker gives the location as west 1/2, northeast 1/4, section 32, township 38, range 43; marked as "15" on the map of Ellersick Brothers mill sites. Aerial view of Ione, WA looking west. Postcard of Ione, WA postmarked 1914 sent to Isabelle Ellersick, Sandpoint, Idaho, "Did you get my letter, I sent it at Laclede. …" The rest is illegible. After this apparent job near Ione, John Sr. and George Sr. returned to Spokane and operated the Long Lake Trucking Company hauling lumber. They also had a mill at Mount Spokane. Wave Ellersick, Jack Jr.'s wife, wrote, "Of course, John and George got itchy feet and sawmills were in their blood. Therefore, John gathered everyone's money, including Bertha's [Henry's widow] and the Ione, Washington, mill was born. The two families [John and George] lived in the same house, one upstairs and one down." Ione is on the Pend Oreille River, located in Pend Oreille County in the extreme northeastern corner of Washington State. Charles Barker recounted two other lumbering operations for the Ellersicks, both in the 1920's: From 1920 to 1922, he says, they cut for the Frost Brothers up Cedar Creek, west of Ione, with a capacity of 40 million board feet; and from 1924 to 1925, they were at the Clement Penzig homestead up Little Muddy Creek, Ione. These dates and places compare somewhat favorably, although not exactly, with family member recollections and the Ellersick payroll book. The payroll book does not provide evidence of where the mills were located, only time periods. In the 1990's, family members, led by long time Ione resident, Lewis Koch, visited two locations believed to be the sites of the mills. The mill sites are remote even today. John F. & George F. Ellersick families' home in 1920’s, Ione, WA. Photograph taken in the 1990's. The location of Big Muddy Mill is shown on the mill sites map and was in the center of section 16, a state school section, in range 42 East and township 37 North on Big Muddy Creek. This area is in the mountains about three miles west of Ione. The mill, a joint effort between the Ellersicks and Frosts, was known as both the E. E. Frost Mill and the Ellersick Big Muddy Mill. The Ellersicks and Frosts worked together at the Ellersick Riverside Lumber Company in Laclede, Idaho. In fact, Henry Ellersick's second daughter, Emma, married Ernest Frost in 1909. "The mill built out of Ione in the early 20's was actually built, physically, by my father [George Jr.] and George [Sr.], Fred and several cousins, namely, Jack, Walt, Frank [G.] and Bill. Though I believe Bill was more in the business end along with Uncle John. It was built on 'Big Muddy' rather than 'Little Muddy. "Gasoline Alley," Ellersick Big Muddy Creek Mill Homes, 1920-21. I was there, even though only seven or eight years old. Ernie and I walked about 2 1/2 miles each way to 'Huckleberry School' over towards Huckleberry Mt. and Smackout Valley. All eight grades were taught by one teacher in one big room with a big potbellied wood heater. I was in the second and Ernie was in the 7th. John F. Ellersick at "Gasoline Alley" Big Muddy Creek Mill, 1920-21. Birthplace of Wayne Ellersick. Left to right: John F., George F., Bill Ellersick. Big Muddy Creek Mill, 1920-21. The money behind the sawmill was provided by the Frost brothers. One, Ernie, was married to my cousin Emma. She was a daughter of Uncle Henry and Aunt Bertha. I believe there were six or seven homes in a row, all built from the sawmill production. They built all in the summer and the families moved in before school started. One small house was occupied by a non-Ellersick. The rest of the houses were occupied by the following Ellersick families: Bill and Verna; Uncle John and Florence and Walt; Bell and husband [Walter White]; Frank [G.], Nell and Wayne; [and] my family. Belle Ellersick White, Big Muddy Creek Mill, 1920-1921. At that time a cartoon called Gasoline Alley was popular in the funnies. So someone named our row of homes 'Gasoline Alley'. The reason was that we all burned Aladin gas lanterns and lamps for light. Wayne was born here. I can't think of Bell's husband's name, remember [Walter] White. He was a former freighter seaman. [For] Our drinking water, we carried in buckets for about 1-mile round-trips. The washing and laundry water was brought to rain barrels by a tank on a truck. Had enough history? Ha! ..."
Frank G. Ellersick turning the cant hook for sawyer Jack F. Ellersick at Big Muddy Mill, 1920-1921. The Ellersick Brothers' payroll book dated June 1921 includes the following men working to build the mill: John Ellersick Sr., George Ellersick, William Ellersick, John Ellersick Jr., Frank G. Ellersick, Walter Ellersick, W. E. White, C. W. Paterson, E. L. North's name is crossed out, Gust Peterson, Scott Riley, C. Reutch, M. Gadeau, John McPhee, C. Griffin, Jerome Mathews and I. Johnson. Gust Peterson, G. W. Paterson, A. Lemke, M. Gadau, C. Griffin, and George Ellersick Sr. are listed working to build roads. Ellersick Brothers' Pay Roll for Big Muddy Creek Mill, June 1921. Page 129 of Ellersick Pay Roll Book containing lumber operation finance records from August 1903 to December 1921. After the mill was built, the July 1921 payroll shows about 38 employees, many part-time, and a payroll of $2,365. Typical pay per day was $3.50 to $6.00, to a high of $8.00 for George Ellersick Sr. As can be seen in the family photographs below, the mills were not of the size of the mills the Ellersicks had built a decade earlier. The Ellersick Brothers' payroll book shows activity, for this time period, for the months April through May of 1920 and June through December in the year 1921. Logs up bull chain at Ellersick Big Muddy Creek Mill near Ione, Washington, 1920-21. Ellersick Big Muddy Sawmill near Ione, Washington, 1920-21. Mill Pond Operations in Big Meadow at Big Muddy near Ione, Washington, 1920-21. "White Pine Savages" at Big Muddy near Ione, Washington, 1920-21. Operation of the Big Muddy Mill was hard work and a family operation. The typical logs were cut in 16-foot lengths and normally were about 20 to 24 inches diameter. Large white pine logs were approximately 30 to 35 inches in diameter. Work at Big Muddy Mill was hard as described in Doris Schank's Big Smoke article in 1990. It is not known if the mill was operated in 1922 and 1923. The last mill known to be operated by the Ellersicks was located north of Big Muddy Creek on Little Muddy Creek. Mr. Barker says the mill operated from 1924 to 1925. Remnants of the mill include a firebox that heated the steam boiler setting and is pictured below. On Little Muddy, rough cut lumber was flumed down the draw to Ione to be planed. They were cutting lumber for making ten quarter match planks with the boards 2.5 inches thick by 12 inches wide. The photograph below also shows that a railroad was constructed to haul logs. Ellersick Brothers Little Muddy Mill under construction, 1924. Fannie Kahlert Ellersick, John Ellersick Sr.'s wife by Little Muddy Flume, circa 1925. Little Muddy Railroad, circa 1925. "Our Happy Home," Logging Camp, Bunkhouse, and Cookhouse at Little Muddy, circa 1925. Between 1920 and 1925, timber market conditions were greatly improved after the depression in 1915. The Ellersick Brothers returned to the business they knew, grew up in, and loved, but the new venture did not last long. Perhaps the Ellersicks left their Little Muddy Creek Mill because they had cut all the white pine from the land they had purchased or controlled and did not have enough capital to buy more. Alternatively, maybe the small scale of their operation could not sustain itself against the bigger lumber companies, such as Panhandle and Diamond Match. From this point on, Ellersicks remaining in the lumber industry would work for large lumber companies. Others would move out of the timber industry and out of Pend Oreille County. Heritage's Resort, Little Pend Oreille Lake. John Ellersick, Sr. and his four sons returned to Spokane and to Northern Idaho. William H. "Bill" Ellersick went to Boundary County, Idaho, in 1924. He was employed as a bookkeeper for the A. C. White Lumber Company. Bill's brother, John F. "Jack" Ellersick worked for A. C. White at about the same time and later Jack worked for the Panhandle Lumber Company at Spirit Lake, Idaho. John Sr. and Louise Ellersick moved to Bonners Ferry in 1928 from Veradale, Washington. John Ellersick was engaged in the sawmill business in Bonners Ferry. Walter Ellersick, John's son, moved to Bonners Ferry in 1928 to take over the Texaco dealership with his brother, Bill. In 1930, the two brothers established the Ellersick Brothers' sawmill and planing mill on property near the present W-I Forest Products. Walt's wife, Phyllis, currently (1998) lives in Spokane. The family of George Ellersick, Sr. remained in Pend Oreille County during this time. Adeline, the oldest child, married Denver Willey, a musician, and had two sons, Richard and Robert (Bob), in Ione. Alfred, known as Fred, married Esther Stecker in Ione. Fred and Esther moved to Elk, Washington, and managed a gas station located diagonally from where Millers One Stop stands today (1998) on U. S. Highway 2. Fred and Esther divorced and Fred then married Lois Bennett and moved to Newport, Washington. Ella married Ed Wilkins and they had two girls, Geraldine and Arlene. Beardsley Store, Ione, WA. Maude and Ed Beardsley behind counter on right. George Herman Ellersick, my grandfather, married Louise Alice Beardsley in 1929. 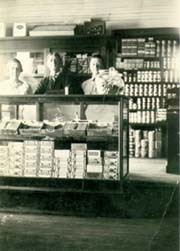 The Beardsleys operated a grocery and dry goods store in Ione. George and Louise had a son in 1938, Don, my dad, while living in Ione and another son, Gary, in Newport in 1944. Ernest, known as Ernie, married Georgia Hale and they had a daughter, Yvonne. Georgia and Yvonne currently (1998) live in Spokane, Washington. Ernie's and George's names appear in the local papers, like the July 21, 1932 Metaline Falls News, working for Pend Oreille County on road and bridge construction. The youngest son in the family, Howard who is quoted earlier in this story reminiscing about growing up at the Big Muddy mill, married Barbara Hampton; they had two daughters, Terry in 1941 and Deanna in 1942. Ione Basketball Team, circa 1920. From left to right: Clifford Hopkins, 2 unidentified, Ed Wilkins, unidentified, George Ellersick, Jr., and Coach Elmer Widger. The Panhandle Lumber Company was the main employer in Ione during this time. In the 1920's, the Diamond Match Company was quietly accumulating white pine and building mills. The effects of the nationwide Depression was felt in the Pend Oreille County lumber industry, and 1932 saw the lowest lumber production in 60 years. However, Diamond Match seemed to feel the effect of the Depression much less than most of the other companies. That may have been because the demand for matches declined very little during the depression. People continued to ignite fires, light their lanterns, and smoke. Despite the Depression years, the Ione area appeared to be a great place to grow up. Howard Ellersick and Bob Willey recalled they did not know how poor they were. They reminisced that they had great times, loved the outdoors, and enjoyed hunting birds, fishing, picnicking, and plinking (shooting cans with a 22 rifle). Plinking in Ione, WA. Left to right in right photograph: Ed Beardsley, George Ellersick Sr., George Ellersick Jr., Maude Beardsley. Howard, Jack and George were good athletes and participated in sports. George Ellersick Jr. played baseball on the local Ione team and Jack played for Spirit Lake. Howard Ellersick said that George once turned down a professional baseball contract. George was a growling catcher nicknamed "Cotty" for his white hair. The local weekly newspaper, The Ione Gazette, often had stories about the baseball team on the front page during the season. Ione baseball field where George Ellersick Jr., played. Taken in 1990's. Ione Baseball Team, circa 1930. George Ellersick, Jr., is standing in the back row, fourth from the left. On the far right of the second row is Percy Gardiner. Ione Semi-Professional Baseball Team, circa 1930. George Ellersick, Jr., and Bill Moran are the third and fourth players from the left. The player on the far right may be Percy Gardiner or Zeek Ogle. Ellersicks have roved the Pend Oreille River for over 97 years! The white pine tree brought John, George, and their families, to the Ione vicinity in 1915, where they built sawmills on the Big and Little Muddy Creeks. The father of these Ellersicks, Herman Ellersiek, had been lured west in 1901 by the white pine forests of the Idaho Panhandle, to Kootenai Bay on Lake Pend Oreille and Riverside on the Pend Oreille River. Herman Ellersick and sons brought their white pine lumbering knowledge from Minnesota where they operated the large, successful Park Rapids Lumber Company. Truly, for over 40 years and in the states of Minnesota, Idaho, and Washington, the Ellersicks had been "White Pine Savages." Looking back, the Ellersicks had many successful years working hard and playing together as a family. "I envied them all - they seemed to have had a great time - together," Bob Willey, son of Adeline Ellersick Willey, wrote in his Ellersick family photograph album. Currently in 1998, my mom Sandy, brother Jeff, uncle Gary and their families are fortunate to live on Diamond Lake and on the Pend Oreille River in Pend Oreille County, Washington. Ellersicks have had a presence in Pend Oreille County, Washington, for over 80 years. In fact, the fifth generation of Ellersicks, John George and Donald Jack, sons of Jeff and Diane, continue to live in Pend Oreille County. A sincere thank you goes to the following people for their time, effort and generosity in helping with this and future projects: Frank and Loreen Ellersick, Bob Willey, Steve and Betty Porter, my mom Sandy Ellersick, my grandmother Edna Dyke, my wife and kids Sylvia, Erica, Anna and Erin Ellersick, Yvonne and Bill Piper, Alice Crysler Warner, Phyllis Ellersick, Georgia Niemi, George Lundeen, Lewis Koch, Gerry Potter, Harvey Woodman, Sarah Thorson Little and Lorraine McConaghy. For more of the Ellersick story in North Idaho read Frank J. and Loreen Ellersick's articles in the History of Boundary County Idaho and in Beautiful Bonner: The History of Bonner County, Idaho.